The horror of India’s partition, in particular the partition of Punjab, has been visited by many prominent writers like Bisham Sahni, Amrita Pritam, Rahi Masoom Reza, Ismat Chugtai and of course Saadat Hasan Manto just to name a few. Indian Cinema too has seen various films made with the partition as a backdrop like ML Anand’s Lahore (1949), Manmohan Desai’s Chhalia (1960), Yash Chopra’s Dharamputra (1961), MS Sathyu’s Garm Hava (1973), Govind Nihalani’s Tamas (1986), Pamela Rooks’ Train to Pakistan (1998), Manoj Punj’s Shaheed-e-Mohabbat Boota Singh (Punjabi, 1999), Anil Sharma’s Gadar: Ek Prem Katha (2001), Chandra Prakash Dwivedi’s Pinjar (2003) and most recently, Anup Singh’s Qissa (Punjabi, 2013), though admittedly one senses a discomfort our filmmakers have in openly dealing with this sordid chapter in the two countries’ history. But what of films looking at this dreadful holocaust from the other side, from Pakistan? Especially since the two countries’ perception of Partition is so different. To India, by and large, there is hurt and bitterness as we feel that we lost a part of ourselves when the country was divided whereas to Pakistan, it was a triumph with them getting their homeland after much suffering and sacrifice. Yes, 1947: Earth was based in Lahore on Pakistani writer Bapsi Sidhwa’s book The Ice-Candy Man but the film was made by a director of Indian origin (Deepa Mehta) and largely with an Indian cast and crew so in that sense it could hardly qualify to be Pakistani. Similarly Khamosh Pani (2003), though directed by the Pakistani filmmaker Sabiha Sumar, has a cast and crew that is mixed with among others – screenplay writer Paromita Vohra and key cast members like Kirron Kher and Shilpa Shukla from India. However, one Pakistani film looking at the partition that one came across by accident when a fellow filmmaker friend visited Pakistan and on coming back gave one its VCD to view, is the Punjabi film Kartar Singh (1959). The film proved to be quite an eye opener, especially since one knows little about the Pakistani film industry. Notwithstanding the fact that one has always been given this fixed ‘image’ of Pakistan. Unheard of this side of the Wagah border, Kartar Singh is, in fact, considered one of the all-time great Punjabi films to ever come out of Pakistan. 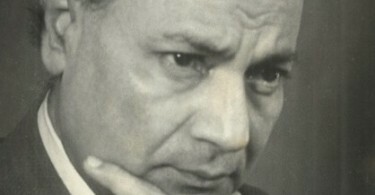 The film is written and directed by Saifuddin Saif and stars Sudhir, a top hero of Pakistani films for 4 decades, Mussarat Nazir – known later on for her rendering and popularisation of Punjabi folk songs like Mera Laung Gawacha and Latte Di Chadar, Bahar, Laila, Zarif, the great playback singer Inayat Hussain Bhatti and Allaudin in the title role of Kartar Singh. Kartar Singh, though terribly dated in its technique, still works reasonably well due to the powerful inherent story. The film manages to bring out the horrors of partition, of how man debased himself totally and the absolute, senseless violence he unleashed on a fellow human being in the name of religion. In fact, what strikes one as a pleasant surprise about Kartar Singh, actually is the restraint in the story in terms of dealing with the various communities and bringing forth the message of humanity. There is no blatant India bashing or Hindu-Sikh bashing as one would have otherwise thought. If Kartar Singh is a trouble maker and the Sikhs are responsible for the rioting and killing of Muslims, there are also other Sikhs like the elderly Sikh who balance them out with his goodness, even killing his own son to protect an abducted Muslim woman’s honour. 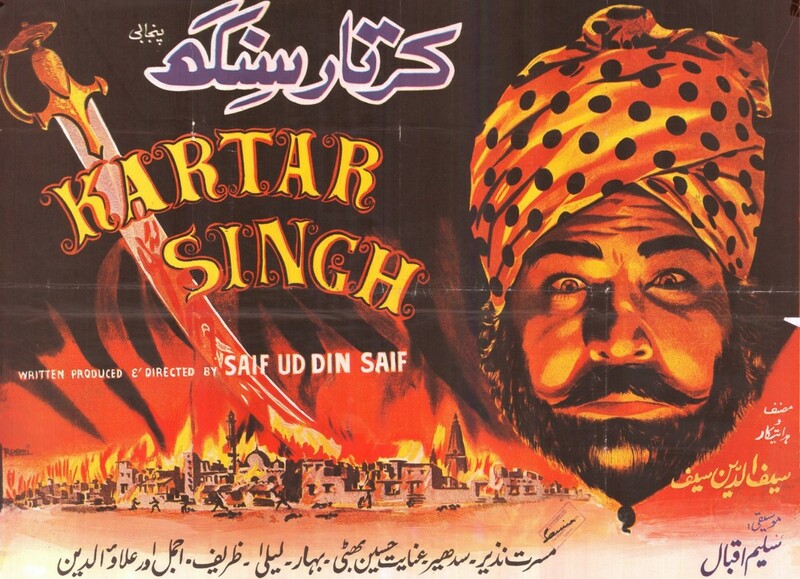 And Kartar Singh too, the main villain of the film, finally repents his dark deeds and sacrifices his life as he returns Umer Din’s brother to him in Pakistan (though it has to be said here that the border scuffle and Kartar Singh’s subsequent change is unconvincing and happens only because the script demands it rather than it appear to happen naturally). The vaid Prem Nath, a Hindu, too is a righteous and good man who shelters Umer Din’s younger brother and is pained by the disintegration of the village due to the partition. True, no one from the Muslim community has been portrayed as negative but then they are a minority in the village and ultimately have to suffer and leave for Pakistan where they have to rebuild their lives from scratch. So in that sense, the film is as balanced as could be, keeping the bigger human picture in mind. Especially since patriotism is normally one sided with our guys being the good guys and the other side always being the bad guys. After all, our films here too look largely at the effect the partition has had on our people, often the victims of Muslim attacks and abductions. A highlight of Kartar Singh is undoubtedly its music by Saleem-Iqbal, the stand out composition being the rendering of Amrita Pritam’s landmark poem in reaction to the partition of Punjab – Ajj Akhaan Waris Shah Nu, sung soulfully by both Inayat Hussain Bhatti and Zubaida Khanum. Other songs that deserve a mention are the patriotic song Ajj Mukk Gayee Ae Gaman Wali Shyam Tenu Sada Pehla Salaam sung with great feeling and emotion by Bhatti and Salim Raza as the Muslim refugees reach and salute their promised land – Pakistan, the romantic Gori Gori Chandni di Thandi Thandi Chhan Ni sung by Zubaida Khanum picturised on Umer Din and his lady love in happier times in the village and Desan Da Raja rendered by Naseem Begum as Umer Din’s abducted sister sadly remembers him and her family. What has not held up well at all in Kartar Singh however is the acting and its story telling techniques, even if the film still enjoys a highly respected status in Pakistan as do the performances of Allaudin, Sudhir and Zarif. The Pakistani film industry was always behind ours by lightyears as they had to literally start their industry from a zero level in 1947. Hence though Kartar Singh was made in 1959, its stagey acting and tacky technique is more like our films of the early 1940s and at times even cringeworthy. But as mentioned earlier, music is an exception and Pakistani films have always had a strong and unique musical tradition in their films right from the beginning, especially their Punjabi films. The film, released on June 18, 1959 on the occasion of Eid-ul-Azha, was one of the biggest hits of the year and has since acquired cult status in Pakistan.